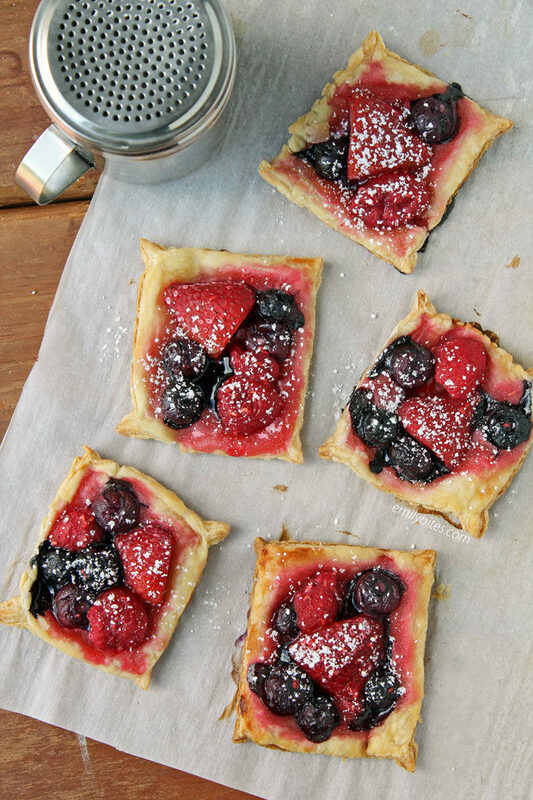 These Mixed Berry Puff Pastry Tarts are the perfect just-sweet-enough dessert, or even a special treat as part of your morning breakfast (if you see them as more of a danish). I ate them for both, so…who needs to choose? 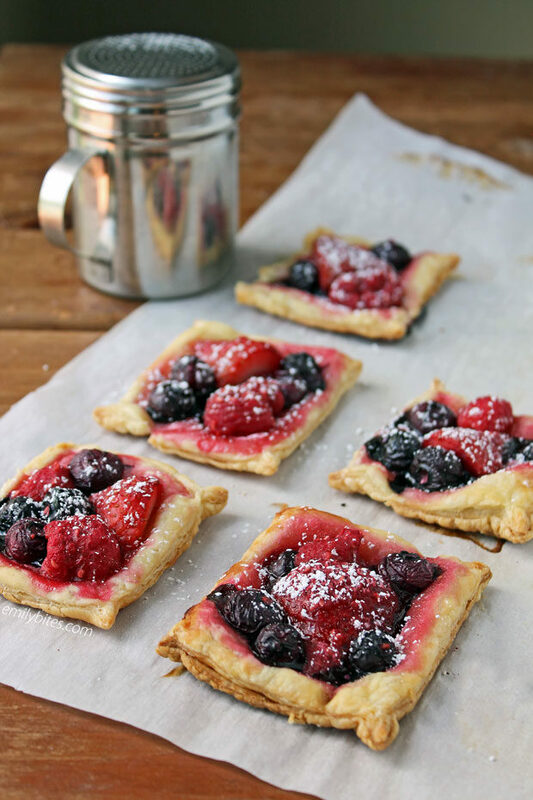 I love these for a summer party, but flaky, crispy puff pastry with warm, juicy berries and a sprinkling of powdered sugar is something I will always be in the mood for, no matter the season. 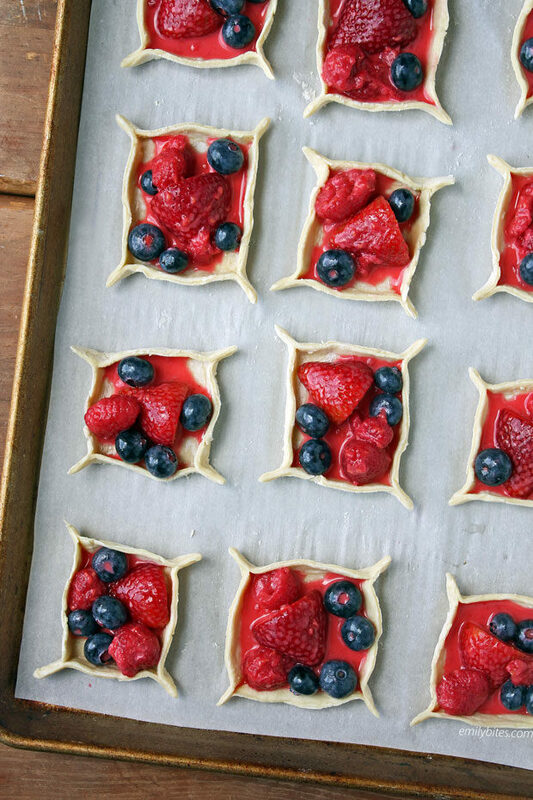 These are versatile, so use whatever berries you have on hand. I had a mix, but you can definitely just make blueberry or raspberry tarts if you wish. My husband loved these too so I know we’ll be making these again, plus, who doesn’t love a dessert that’s only 99 calories or 3 Weight Watchers Freestyle SmartPoints? Looking for more flavorful, lightened up dessert ideas? Check out my Apple Cinnamon Cheesecake Cups, Pumpkin Pie Bites, Blueberry Cheesecake Rolls, Peaches and Cream Dessert Flats, Pecan Pie Bites, Peppermint Cheesecake Cups, Mixed Berry Mini Tarts, Cheesy Cinnamon Baked Pears, Pumpkin Pie Pastry Pockets, Cannoli Dip, Key Lime Cheesecake Cups, Roasted Strawberry, Brie and Chocolate Mini Tarts, Mini Cinnamon Apple Tarts, Chocolate Covered Strawberries, Bumbleberry Crumble, Carrot Cake Cupcakes, Chocolate Chip Cannoli Cups, Cherry Cheesecake Cups, Dark Chocolate Orange Cupcakes, Peach Basil Tart, Cheesecake Stuffed Strawberries and more in the dessert section of my recipe index! Pre-heat the oven to 400 degrees. Line a baking sheet with parchment paper and set aside. In a mixing bowl, combine the berries, sugar, cornstarch and salt and stir together to combine. On a clean, dry cutting board sprinkle a small amount of flour to prevent sticking and lay down your sheet of defrosted puff pastry. Using a rolling pin, roll the pastry into a 10”x14” rectangle of even thickness. Using a knife (or a pizza cutter works wonderfully for this! ), cut the dough into 12 equal pieces (3 sections lengthwise and 4 widthwise). Place the pastry sections a little bit apart on your parchment lined baking sheet. Fill a small dish with water. Dip your finger in the water and run it along the edges and corners of one of the pastry squares. Use your fingers to pinch the corners together, raising the edges to form little walls surrounding the inside of the pastry square (see photo). Repeat with all remaining pastry squares. Divide the berry mixture amongst the pastry squares and place inside the pastry walls. Place the baking sheet with the pastries into the fridge (or freezer) for 10 minutes to chill (puff pastry puffs better when it goes into the oven cold). Transfer the baking sheet into the preheated oven and bake for 20 minutes until the pastry is golden and puffy. Remove from the oven and sprinkle/dust the pastries with the powdered sugar. can frozen mixed berries be used? Can you use sugar substitute? I’ve never tried it but I’m sure you probably could. Just check the ratio, because I know some substitutes are much sweeter than sugar so you’d want to use half as much.